What’s up brides? Are you all geared up for the D-day? Have you been able to shortlist your bridal lehenga? Did I hear you say that you are looking for something which is a bit traditional and a bit modern.. Looks ethnic yet stylish? So, today we have got not one but 25 gorgeous bridal lehenga designs for you to draw your inspiration from. Afterall, we want to make sure that you look stunning in an outfit you have been dreaming about ever since. 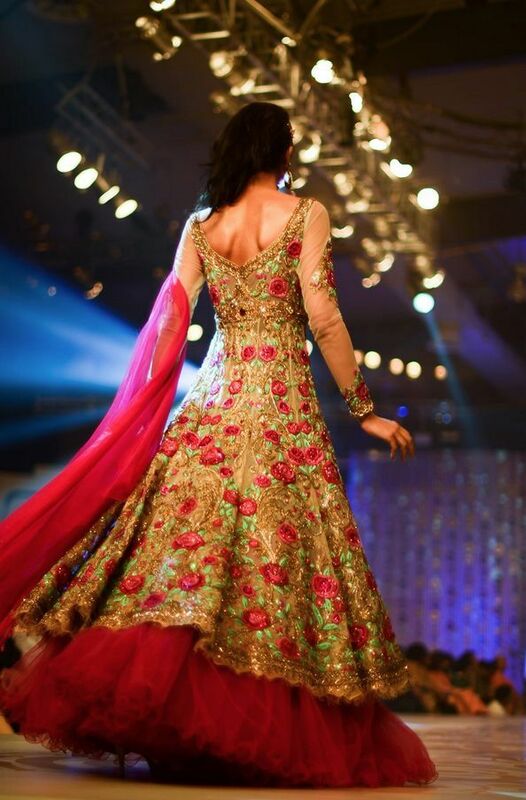 That same lehenga that you have visualized so often, that when you see, you would know it’s the one! Take a look at a collection brought to you by Zuri. These lehengas are exquisite, beautiful, glamorous, comfortable and celebrate life in a blissful way. Whether it is a theme wedding with a particular color being the focus-point, a destination that tends to rule the attire or a motif as the signature design for the entire wedding, all you have to do is customize it as per the requirements. But, if you aren’t too keen on the concept of getting it stitched, then visit designers such as Rohit Bal, Anita Dongre, and Manish Malhotra. Their latest 2015 collection is bespoke, traditional, ethnic as well as modern. In-sync with the latest color-theme, embroideries, fabrics with a dash of their own signature style. Take for example-Rohit Bal. His latest bridal collection has been themed around the color Ivory. Brides who are in love with subtle colors or have a day/summer wedding can go for something from his collection. Opt for a collared long jacket with flared lehenga or a short jacket on a choli. Bal has made sure that his signature floral motif is represented in each and every piece! Speaking about jackets! This might sound quite odd though, but a silk/velvet jacket (with heavy embellishments) is so trendy these days that you can have it on at any of your wedding functions and still look super-stylish. In fact, this is a great option for the brides getting married this winter. Besides, an awesome way to beat the winter chill 😉 However, do make sure that your wedding lehengas is simple. If you are in love with a bit of a bling then Anita Dongre is just the designer for you. A perfect royal lehenga for your wedding day with shades of bright gold and deep red or burgundy, detailing with gota-patti work and zardozi on both lehenga and a crop top. Now, isn’t that splendid? These days, another trend that has become quite a rage is the quirky color theme. Last month I attended a wedding and saw the bride flaunting a pastel colored choli paired with a neon ghagra! What a visual delight. If you aren’t too sure of this style for the wedding day, then go for it for your mehendi ceremony. If it’s a winter wedding, then opt for a silk choli and pair it up with an embroidered ghagra. This combination will give you a perfect traditional yet fashion forward look. Another amazing trend in the world of Indian fashion scene is a long choli.. Like a kurta. A lehenga with a long choli is just perfect for your engagement. You can have your choli in a combination of net and any other fabric, such as silk, satin or velvet. So, you lovely bride-to-be! Are you all set to look gorgeously pretty on your special day? Atleast we look forward to your beautiful wedding pictures.